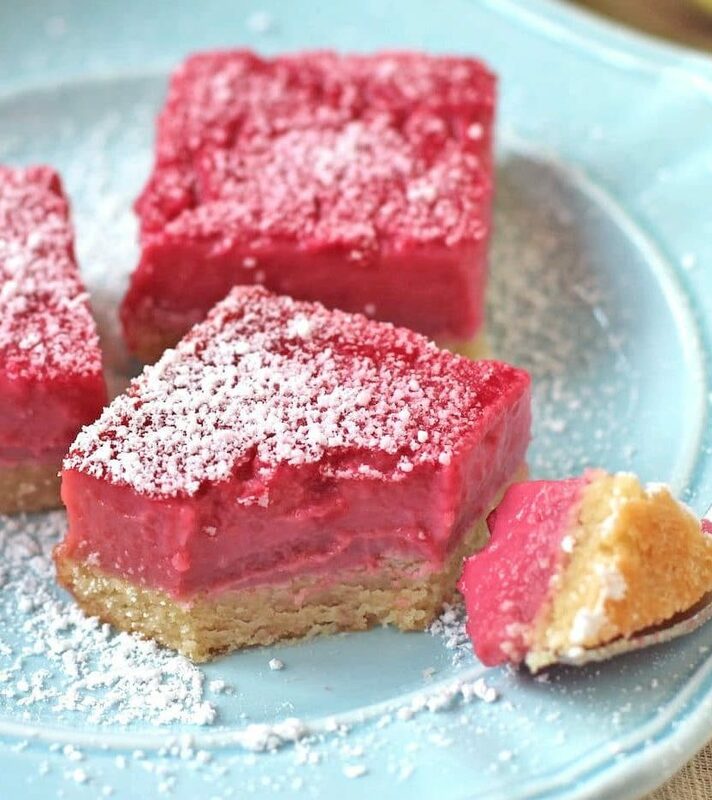 What happens when you add raspberries to delicious Lemon Bars? 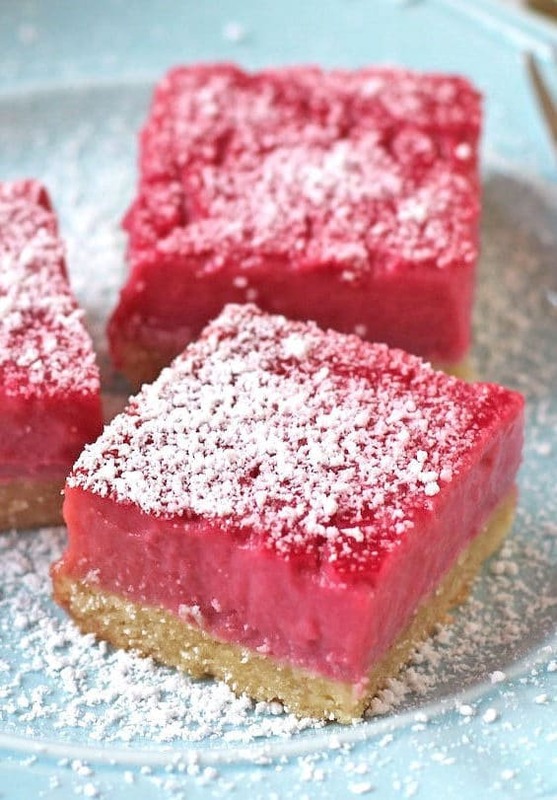 You get Raspberry Lemon Bars! But don’t let their size fool you, these bars may be small but they pack a punch FULL of flavor. This palm-sized dessert is incredibly tart from the lemons and refreshing from the raspberries. 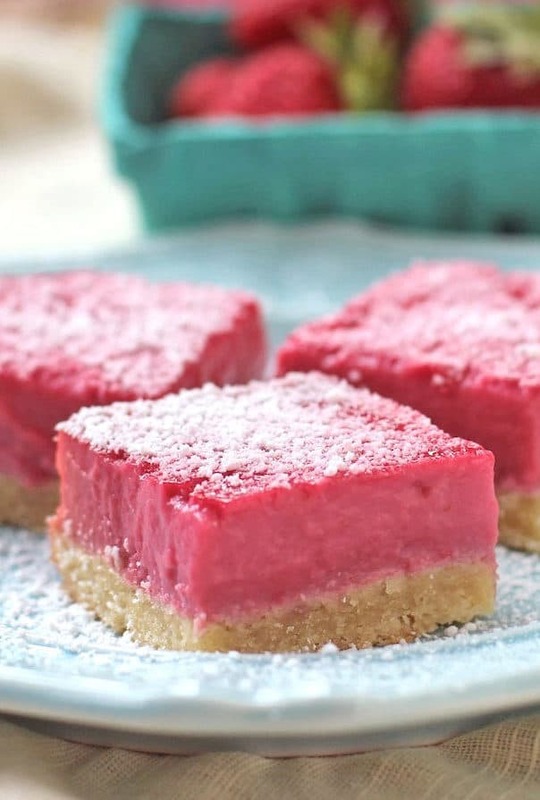 These Healthy Raspberry Lemon Bars are sweet, simple and ultimately satisfying for the sweet tooth out there. They taste like they are full of sugar and butter, but shhhh, they’re sugar free and butter free (oh, and gluten free, dairy free, paleo, keto, and even high protein too)! 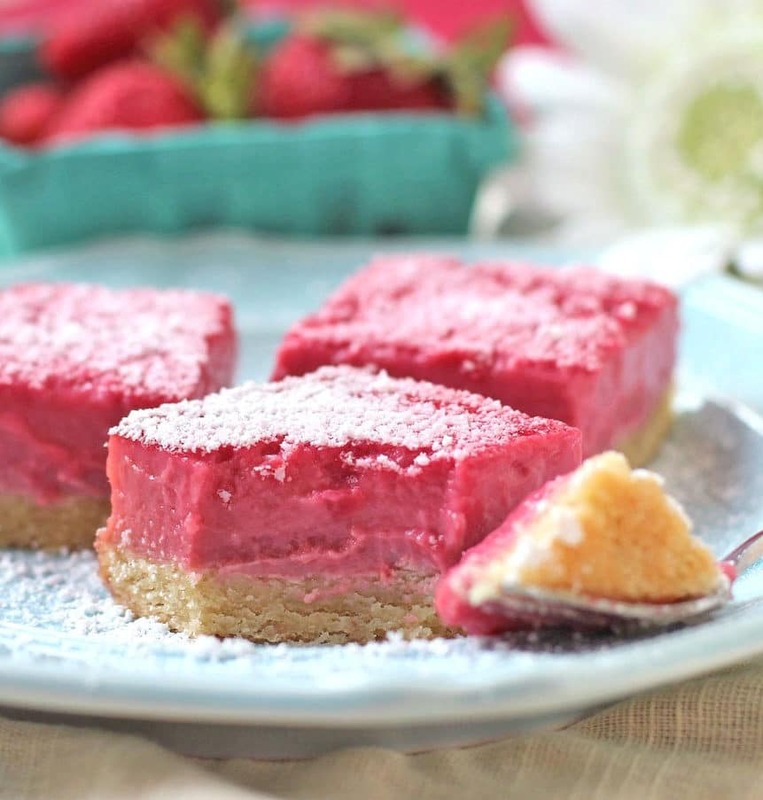 Mmmm… a soft almond crust with a smooth and creamy raspberry lemon filling. 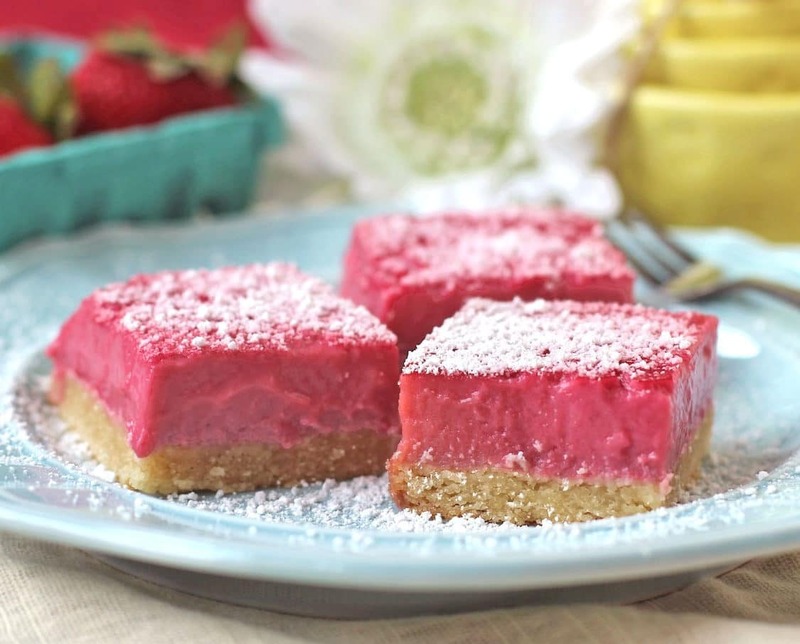 These Healthy Raspberry Lemon Bars were gone. IN. A. FLASH! 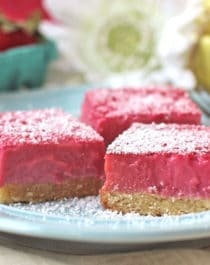 These Healthy Raspberry Lemon Bars are so light, refreshing, and delicious, it's hard to believe they're sugar free, dairy free, and high protein too! Preheat the oven to 350 degrees and line an 8" brownie pan with parchment paper both ways. Fold a strip of foil into a finger-length sized rectangle and fold over the parchment paper to keep it upright against the side of the pan so it doesn't fall. In a medium-sized bowl, stir together the almond meal, erythritol and salt. In a small bowl, stir together the soymilk and butter extract. Pour over the dry ingredients and fold together (it should be like a pasty cookie dough). Scoop the dough into the prepared pan and spread to the edges (you can wet your fingers and press down on the dough to help). Bake for 30 minutes, or until the surface is firm to touch. Make the filling while this bakes. *Put two 6oz containers worth of raspberries in a large sieve over a bowl. Press on the raspberries with a spoon until they crush/burst and their juices flow into the bowl (occasionally scrape the underside of the sieve to get the puree clinging to the sieve). You should get 1¼ cups of puree, pour this into a stand mixer bowl with whisk attachment (you could probably put the raspberries in a blender and then strain the raspberries later). 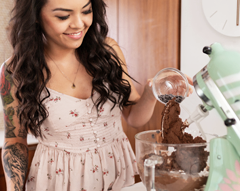 Add the eggs and stevia extract to the stand mixer and whisk on medium/low speed. Slowly add the corn starch while whisking, then add the beet puree. Add the lemon juice and whisk thoroughly. Pour the batter over the baked crust and bake for ~25-28 minutes, or until the center no longer jiggles when pan is shaken lightly. Let cool for ~20 minutes in the pan, then transfer to a wire cooling rack to cool completely. Slice and place bars on a serving platter. Refrigerate overnight and serve the next day! Wow, only 100 calories?! I’LL TAKE IT! Compared to a typical Lemon Bar recipe I found online, my recipe has less than half the calories, 2.5x the protein, and contains healthy fats only (the original recipe has 210 calories, 35g carbs, 23g of sugar, and 2g protein per bar). Other than the ingredient list, this nutrition label also shows how healthy this recipe is. I mean, with no white sugar, hormone-filled butter and bleached flour, you can’t really go wrong now can you? Refined/processed ingredients not only add a ton of calories, but they add a ton of empty/non-nutritive calories. The ingredients used in this recipe are quality ingredients — good for you, nutritious and do your body good rather than harm. These look DELICIOUS! I’ll be trying them soon! Just discovered your blog today and I love it! 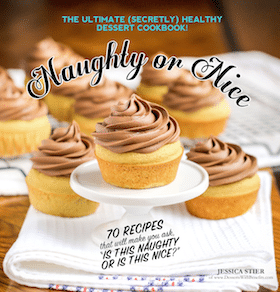 Love the focus on healthy recipes, beautiful photos, real ingredients and overall layout. These bars look delicious! I’m definitely going to give them a try. I made these today and they are delicious! I was expecting the almond crust to fall apart (whenever I make a ‘healthy crust’, it falls apart) but it didn’t! Just wanted to say hey and thanks for all the great recipes and inspiration!! 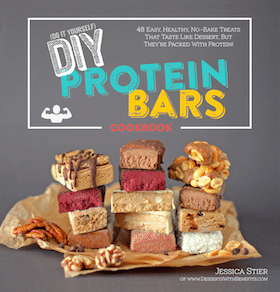 As someone who spends lots of time indulging in sweaty endeavors, I am always looking for healthy recipes that will add protein without hindering flavor…yours do that and more :). Love your blog, thanks again for sharing! These bites-sized goodies finger food desserts are perfectly good for kid’s party catering, weddings, and celebrations. This really is about sweet indulges and pleasures. I just love its flavours and tempting texture. These look great! I want to make these for my mom for Mother’s Day. Do you know if blackberries would also work? They’re her favorite! I haven’t tried using blackberries here but I’m sure it would work just fine! I find blackberries to be less juicy than raspberries so you might need to use three or four 6oz containers of berries rather than two, as stated in the recipe. What could I use to replace the cornstarch? I can’t use tapioca flour either. I just made this tonight, although I modified it a bit based on what was in my kitchen. I used frozen raspberries, thawed them a little in the microwave, and just blended them in with the eggs and lemon juice. I kind of messed up with the sweetener. accidentally added 2 table spoons of swerve to the crust, and 1/4 cup of swerve to the filling… also, i only used 10 ounces of raspberries cuz that was what was in a bag frozen, and i added a tablespoon of sour cream to the filling. Why? I have no idea. I just had some in the fridge and decided to add it? I didn’t have beets to puree or food coloring. HOWEVER, I made it, and it turned out SOOOO delicious. I love it. I probably love it too much. It is so freaking good. I need to share it with others so I don’t eat it all myself on accident.